Wherever possible your stairlift supplier should be able to meet the user of the stairlift before specifying the stairlift. Stairlift seats and systems do vary between manufacturers. Whilst it is rare that a stairlift is not suitable, carrying out a User Assessment is advisable. This allows your supplier to not only double check that the dimensions of the lift are suitable for the user and the location, but it also allows them to specify which side controls should go and to discuss the possibility of adding powered features to make using the stairlift even easier. These may not be needed now but could be of huge benefit in the long term. 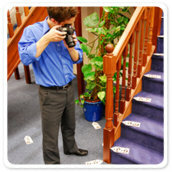 Your supplier will normally wish to conduct a User Assessment at the same time as conducting the Staircase Survey. 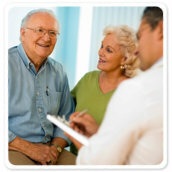 During this assessment some measurements may be taken to ensure the stairlift chosen is suitable for the user. There will also be some simple questions to see which would be the best side to place the controls, what sort of seat belt would best suit the users and to ascertain which features would be required now and in the future. The assessment is non-intrusive and whilst it is preferable that this is conducted in advance the non-availability of the user will not prevent the supply of a stairlift so long as someone will undertake to provide the information on the user’s behalf. London stairlifts are designed to cater for a wide range of abilities and carry a series of adjustments (e.g. seat height) that can be performed during installation to tailor the stairlift to suit the user as required. You do not need to worry about surveying your staircase, your supplier will do this for you. They will advise you of any adjustments required to fit your stairlift (e.g. move a cupboard) and which is the best side of your staircase to fit your London stairlift. Most staircase surveys are quick and easy to perform. If your staircase is more complex with intermediate landings, fan stairs or a spiral for example, the survey will be conducted quickly. Curved stairlift tracks are designed to suit your individual staircase so it is important the staircase is measured accurately to ensure your track is the best possible fit for you and your staircase. Most dealers use the Minivator eSurvey system for surveying curved staircases. This specially developed electronic system maximises the accuracy of a curved staircase survey whilst minimising the time needed to carry it out. Cards are placed on and around the stairs and photographed. Our specialist software measures these images to create an accurate 3D model of your staircase so the track is designed to fit your staircase perfectly.